It is hard to come back to reality after such an amazing few days in Park City at the Art Nest, so many highlights of the fabulous artists and wonderful friendships made those few days. 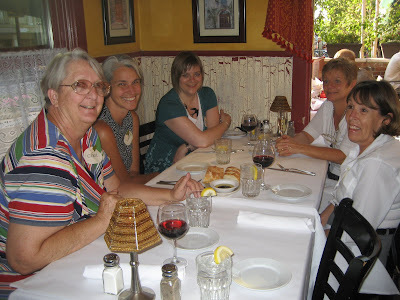 the very first night, we had dinner at the French Bistro on Main Street, the sun was going down and the light was just perfect. 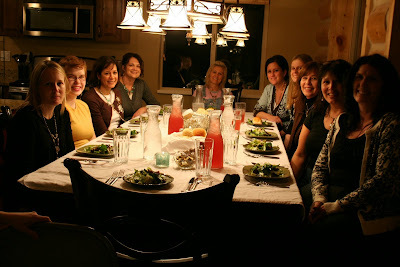 Our first little gathering with the most wonderful food. I had the trout laid on a bed of green beans and mashed potatoes with a garlic lemon butter sauce. It was the best food i have had this summer. I will admit I am a foodie..........but this dinner couldn't have been more perfect. Most of us were licking our fingers (and our plates) by the end of dessert. Molton Lava Cake served under candlelight. 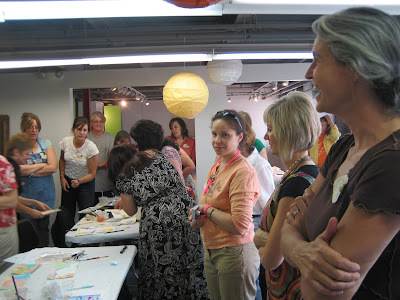 the next day was our class with Stephanie Lee. She was such a generous teacher with real knowledge about her materials. We were joking her saying she could of been a science teacher. 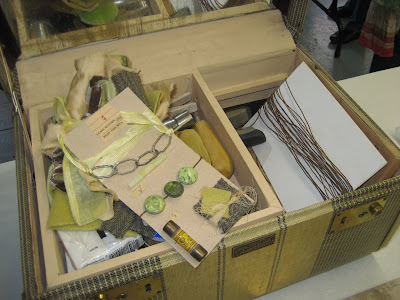 Here is my little junk jewelry suitcase with all of my goodies to use in her class. 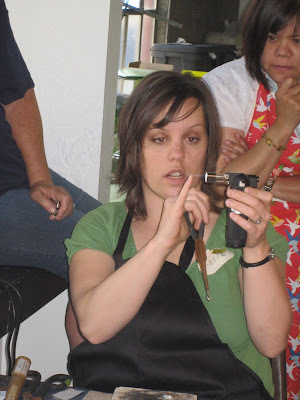 These are her creations that she demonstrated each of the techniques with. Aren't they beautiful? The heart was one of my favorites. 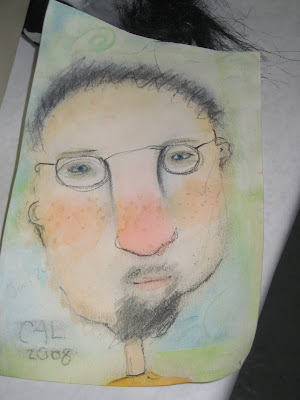 The next day we enjoyed a little whimsey with Carla Sonheim. What a joy to be around such a giving soul. She stretched our imaginations with some resistance, but by the end of class most of us were letting go and having fun. 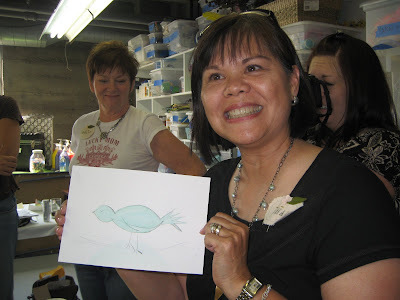 Char was so excited about her little bird she made. I love this smile. The last day was fabric tapestry with Alma Stoller. This was the perfect class for a Saturday afternoon. 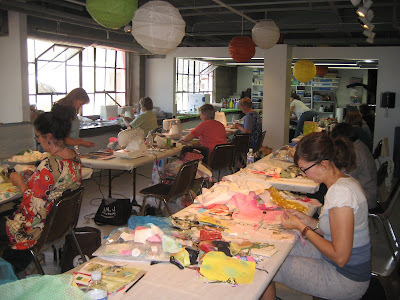 As you can see everyone was enjoying themselves and having so much fun picking through all of the fabric. Alma was very good at having a demo and then letting us go to our piece and try it out. There was so much to learn and do we could have worked on these all night. 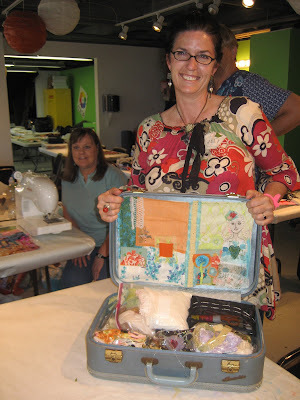 Here is Julie showing us her book cover nestled inside her little suitcase. We have a thing for these little junk suitcases if you can't tell. 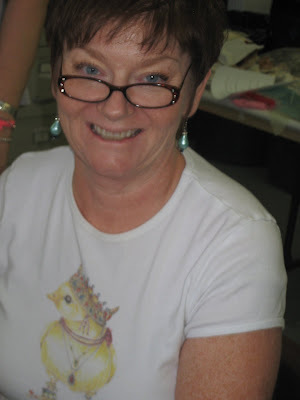 Our sweet Maija ........who is our little art nest mama......it was so fun to have her at the nest again. She looks amazing and is such a dear. As you are gathering all of your little items to bring. A couple of things: If you can bring a sewing machine without much trouble and you prefer to work on your own machine, bring one. We will have a few available for use but it is always nice to use your own machine. Check the supply list that came with your packet, we made a few changes on Stephanie's list. It has been a little chilly here in the mountains this past week. You may want to pack a jacket for nighttime. There have been a few questions about how to dress for the French dinner. Park City dress code is dressy casual, which pretty much means everything goes. However, if you would like to dress up a little this would be the night. heading your way. 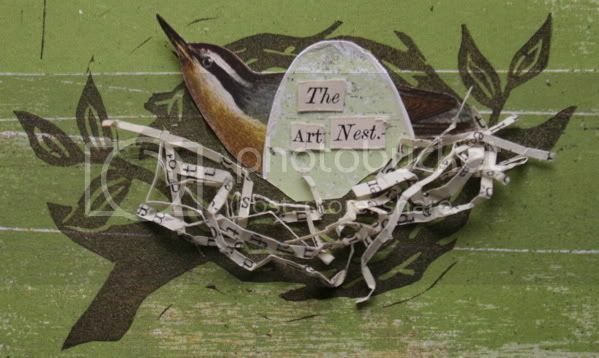 . .
candice and i mailed out the packets for all attending the june art nest retreat in park city this summer. 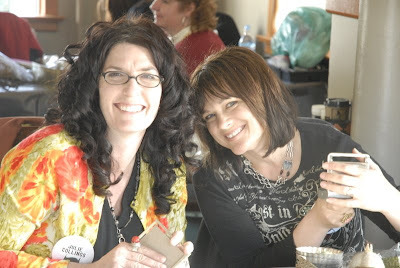 we have had so much fun planning the details for this retreat. 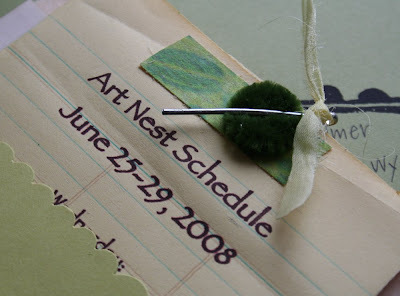 it is the first time having the nest at the Inn, so we have had many new details to work out and it is getting hard to wait the few more weeks until everyone arrives. 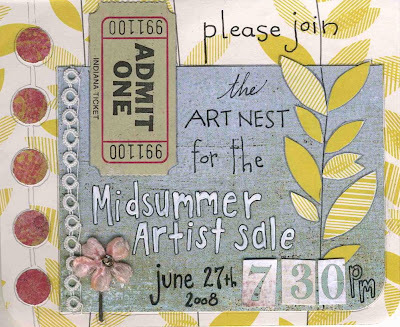 heading your way is a lovely green envelope stuffed with all the details about what you need to bring, your supply list, our schedule, cards from each of the artists teaching, and an invitation to the summer artist sale. we hope we get to host it out under the stars on the patio with the heater going. it is always surprising how it cools off in the evening up in the mountains when it is so warm during the day. 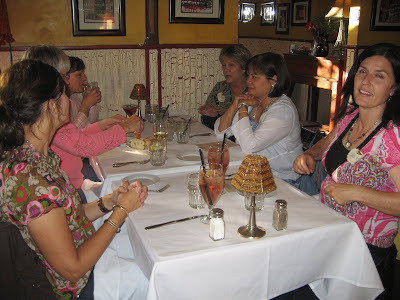 we spent a day up in salt lake shopping our favorite antique stores to gather things for our packet and the goody bag for everyone. 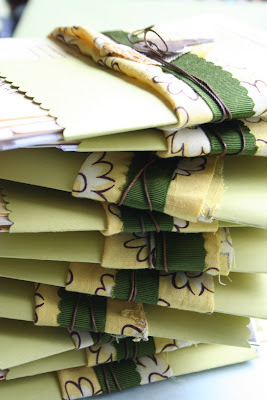 the great yellow flowered material was cut from a vintage dress from the 30's. it had four lovely darts over each shoulder and an old metal zipper sewn in by hand along the side. 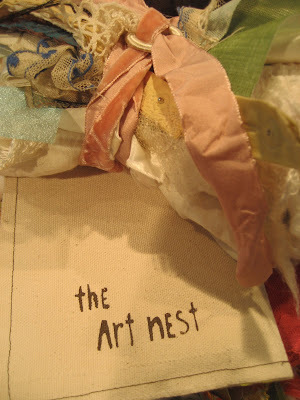 it was too worn to ever wear again so we repurposed the fabric to bundle up your art treats. 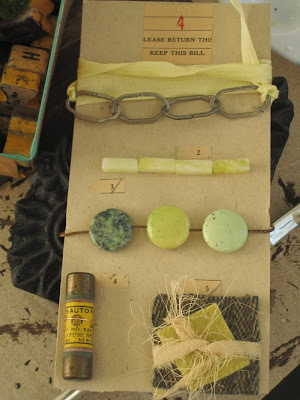 those old keys were all in a little dish by the counter, we couldn't resist thinking they might be so fun to use in stephanie lee's class. the rusted wire we wrapped around the bundle is actually some fishing line that was wound around an old wooden paddle. it still had the tackle attached. i hope all the envelopes arrived safe and sound, helen's packet was sent all the way to the UK! she is flying in a day early to the inn just to get the jet lag over with before we all gather together for dinner at the french bistro wednesday night. oh, and we had a lovely evening taste testing the menu for the night. the molten chocolate cake with vanilla bean cream was delicious beyond description. i am definitely ordering that! candice and julie at artfest. . .
we spent the first day in seattle shopping and wandering the city. we had the best fish and chips at an old irish pub, and met the boys at 'man kilts' probably seattle's only kilt store for men. we stopped and bought three gold vintage curtain panels here at this pottery store. 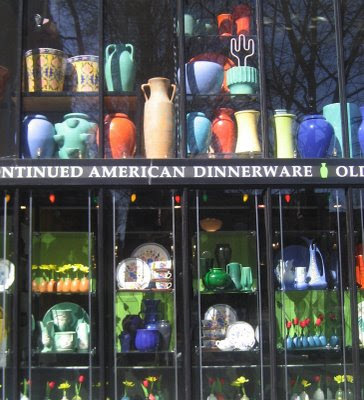 just the the colors in the window were eye candy. we missed the rush hour ferry so we ended up waiting an hour and a half to cross the sound over to bainbridge island and ended up driving the last winding roads to port townsend in the dark. we missed the opening meeting and ended up checking in at 9pm that night. we were tired but happy. what an adventure. 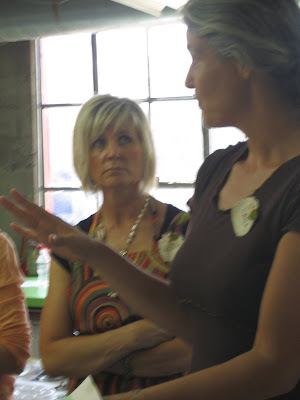 imagine the wonderful surprise of having kecia and jennifer from the february artnest in our house. annie lockhart took this photo of us in her class thursday called 'off the wall'. you can see in our faces we adored meeting annie and taking her class. 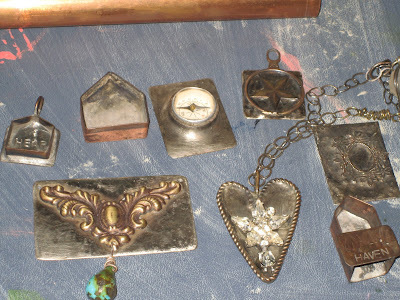 here are the pieces we made in annies class. 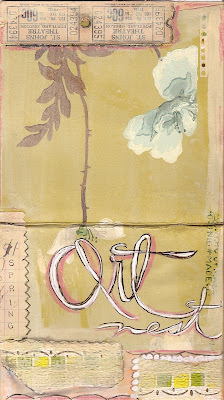 candice's piece was made using an old canvas fishing bag wrapped around a vintage photo frame. it hangs by a vintage wooden spool and the canvas strap from the bag. julie's piece is an old porcelain doll peeking through the cover of an old book. 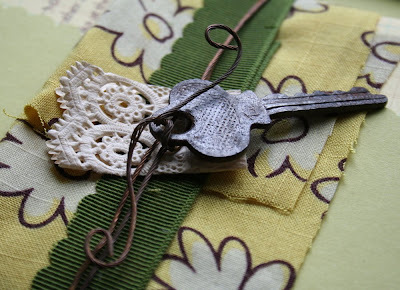 annie had the lovely old ribbon that is tied around the spine and an old silver wire leaf pin is sewn over the ribbon. it was so very fun to see ahahata again and take her class wallpaper people. imagine creating a 6 foot collage on wallpaper. here are our wallpaper people. candice created the handsome man 'as a man thinketh' using old house blueprints for his jacket. sara our housemate brought rolls of them she passed out. 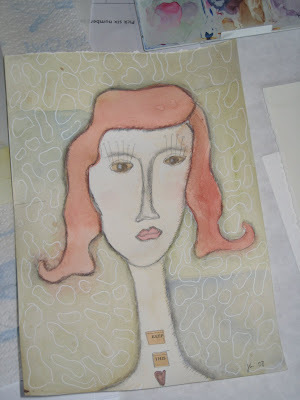 julie made the girl with the songbird throat and the universe inside her. 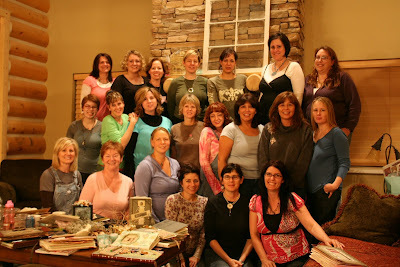 nina's class 'gatherings' was incredible! we started a book made out of book covers with little windows of mica on each page. nina's booth at vendors night was so packed we couldn't even get close. . . her jewelry was displayed like jewels from the sea cast upon the shore, so artfully arranged. more pictures of our books created in nina's class here and here. 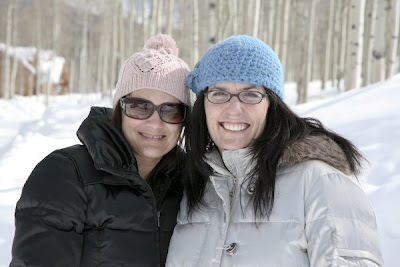 kecia and lisa here with us and the covers of our books. we took a leisurely day sunday with breakfast in town and the slow drive to the ferry. we stopped and took pictures of a few dream houses on the island before heading back to the airport. the art nest gals. 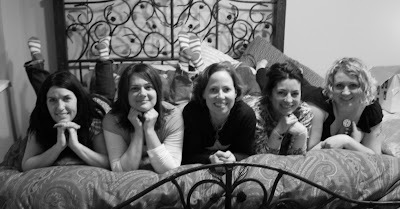 . .
here are all the art nest gals-except jayne, so sorry you were sick sweetie. so i heard later that the ones in front of the fireplace were getting a bit toasty while i was setting up the timer and tripod. . .
the feet socks will live on, everytime i put those cozy striped socks on i will be thinking of the art nest! 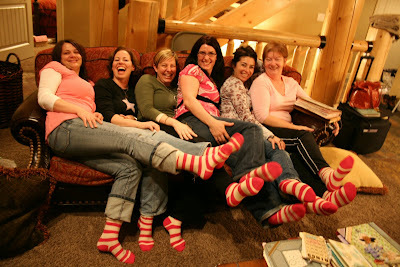 here are candice, pam, laurie, julie, amy, and maija getting a bit cozy on the couch. the five of us making faces together. 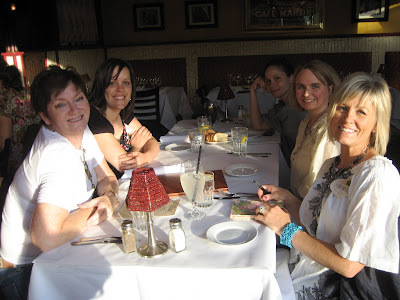 julie, candice, pam, amy, and anahata. 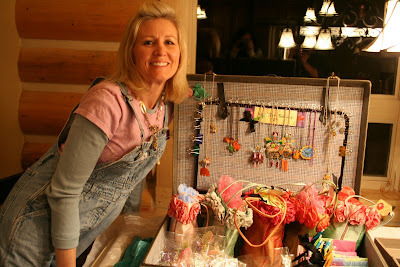 cheryl and her wonder trunk filled to the top with goodies at the artist sale night. 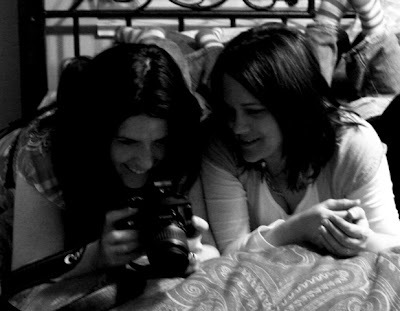 ananda shot this photo of us laughing about the pictures! 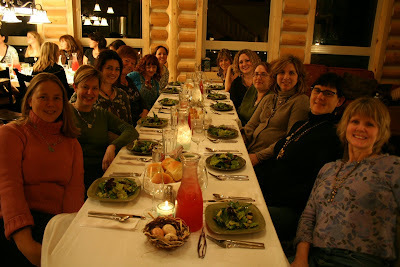 on friday night we set up a candle light dinner. yes, sorry i made you all lean back for the shot. painful isn't it. . .
don't you miss the snow already? kecia took these two great photos of the snow outside the cabin and marina taking a little taste.